Join the Fingerlings monkeys as they get up to mischief in Melody Village. Read about Boris the energetic monkey who loves to play the drums, his sister Bella the keen gymnast, and all their fun-loving monkey friends. Find out how the Glitter Girls get the party started and how t... read full description below. 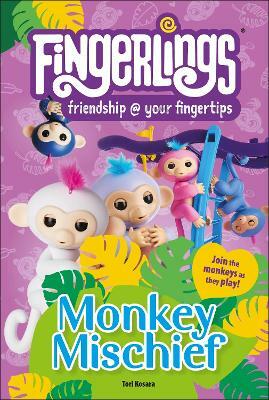 Join the Fingerlings monkeys as they get up to mischief in Melody Village. Read about Boris the energetic monkey who loves to play the drums, his sister Bella the keen gymnast, and all their fun-loving monkey friends. Find out how the Glitter Girls get the party started and how the monkeys play with the other cute animals of Melody Village. DK's reading scheme is levelled into stages to help every child progress and become a confident reader. This Level 2 book is illustrated with photography of the adorable Fingerlings toys, and is a delightful introduction to these cute characters and their world. Presented with vibrant images, simple vocabulary, and lots of word repetition to engage young readers and help them build their literary skills, Monkey Mischief is a fun read for any young fan of the exciting world of the Fingerlings.